Dimensions: 110 x 105 x 80 mm (Small size) – Also available in sizes Medium and Large! Purchase includes 1x BONUS Wrist Carry Strap! 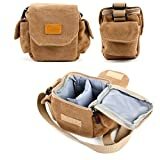 Introducing DURAGADGET’s brand new and exclusive, small-sized light brown canvas carry-bag for your brand new camera. Made from a tough and durable canvas material, this bag is water-repellent and perfect to take with you whilst braving the elements to keep your camera and accessories safe and organised. The main pocket of our bag is fully lined and has a removable padded section, offering two compartments that are separated with a padded and adjustable Velcro divider. This not only keeps the body of your camera separate from your accessories, but also provides the ultimate in shock-proof protection. Customise this bag to suit your own individual needs – the removable interior compartments can be adjusted to fit your camera’s exact specifications. The additional two side pockets, secured with Velcro, offer spaces to keep your other useful accessories close to hand. For comfort on the go, this bag has a durable and adjustable shoulder strap to keep your expensive camera close to your person – whilst also offering completely hand-free use. Made with premium quality, water-resistant canvas material, this handy carry bag will keep your new prized possesion and other accessories protected from the rain and other damaging elements! Any devices shown in our images are for display purposes only. This entry was posted in Discount Photography and tagged Brown, Camera, Canvas, Carry, compatible, DURAGADGET, FZ151, Kodak, Light, Pixpro, Sized, Small, Vintage by Ball Photo. Bookmark the permalink.